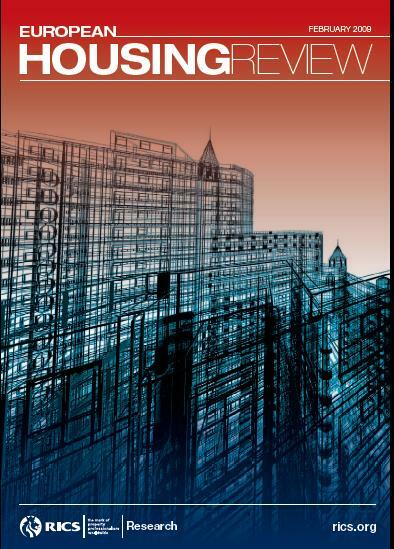 The RICS recently published their annual European Housing Review (2009 edition). A must-read for every real estate professional engaged in residential properties in Europe. Well, it is a full, 130-pages reference-work, covering residential markets in all European countries. Easy to look up country-specific circumstances. So, what are the key messages? House prices are static or falling across all of Europe. The chances of core European housing markets escaping marked downturns in 2009 are now slim. House prices fell significantly in 2008 in central and eastern Europe, Ireland, France, UK and among the Nordic countries. All Europe’s housing markets are experiencing rapidly falling demand and too much supply, due to the impact of the credit crunch and recessions in Europe’s major economies. New build markets in the major cities of central and eastern Europe are at a standstill, with a rising tide of unsold dwellings.